When we were mulling the decision to cut the cord on our expensive cable contract years ago, one of my questions was how to watch HGTV without cable; my husband’s biggest concern was sports. I like having the channel on in the background to tune in and out of while I do other things, so when we were looking at axing our cable satellite service, one of my big questions was how to watch my favorite HGTV shows. Don’t let the cable companies fool you. I’m happy to say that it IS possible to watch HGTV without cable or satellite. You don’t have to be under contract with a cable company to see what latest Waco treasure Chip and Joanna Gaines are renovating. There are multiple ways to see Hilary’s latest interior designs on “Love it or List It” without chaining yourself to an expensive cable contract. If you’ve been wondering, “how can I watch HGTV without cable?” this post is for you. There are at least 12 different ways to watch HGTV without cable, so if you’re wondering where to watch HGTV without cable, we’re going to show you almost all of the ways, including the best and easiest, right here. Sling TV is perhaps the second largest and most well-known streaming option for cord cutters. With its base package of $25 per month, Sling TV comes in a bit cheaper than DirecTV Now, making it an extremely affordable way to watch HGTV without cable. Like DirecTV Now, Sling TV includes HGTV in its base package so you won’t have to add on anything extra or pay more than $25 per month to watch your favorite HGTV shows. It’s likely that the channels you watch most are included in this list. Like DirecTV Now, Sling TV is easy to install and use. You can access it and watch content either live or on demand from your laptop, smartphone, tablet, Roku, Chromecast, Amazon Fire TV Stick or Amazon Fire TV and more. We cover all the particulars in our Sling TV Review, but it’s fairly comparable to DirecTV Now. The only drawbacks as we saw them were the buffering issues we experienced during popular events (like the college football playoffs) and the fact that there was no way to change to a different show or channel without being forced out of the platform altogether. Still, if you want to watch HGTV without cable, Sling TV is a solid way to do it. The Sling TV free trial is a great way to try the service risk free for 7 days to see if you like it. Hulu Live is a great way to watch the latest HGTV shows when they air. We subscribe to legacy Hulu, which means we get on demand HGTV content. For example, I recently caught up on the two most recent seasons of one of my favorite HGTV shows, “Love it or List It,” for free as part of my Hulu subscription. We like it because it allows us to watch HGTV shows without cable, with limited commercials, for only $5.99 per month. Now, I can’t get the new season of “Property Brothers” through that subscription, but you can with Hulu Live, which gives you 55 channels of live TV for $44.99 per month. Hulu Live lets you stream HGTV content live so you don’t have to wait to watch the latest episode of “Home Town” or “Property Brothers.” Hulu Live also lets you watch content on two screens at the same time and create up to six unique profiles. We particularly like this feature since we watch completely different content than our kids. When we login to our Hulu profile, it loads up our shows first instead of “Peppa Pig” and “Ducktales,” which our kids see when they login through their profile. You can check out our Hulu with Live TV review to get a more in-depth review of the service. If you’re on the fence about cutting the cord on your cable contract, try Hulu Live free for 7 days. Philo is a relatively new streaming service that includes HGTV in its basic channel lineup. While there aren’t any sports channels on Philo, if you don’t mind that, and are looking for another option for how to watch HGTV without paying for cable, Philo may be right for you. At only $16 per month, it might be the best way to watch HGTV without cable from a cost perspective. Philo’s low monthly cost is its strongest selling point. Not having sports available to stream is a big part of how it is able to keep its monthly subscription fee so low. Check out our Philo review to get a more in-depth review of the service. That’s just a partial list! If you think Philo might be the best way to watch HGTV without cable TV, you can try Philo free with its 7-day free trial option. However, today, FuboTV has grown and expanded far beyond just soccer content. Viewers can watch Fox News without cable on it as well as other popular channels like USA, FX and of course, HGTV. If you like sports (or someone in your family is passionate about watching them on TV), and you’re wondering where to watch HGTV without cable, FuboTV may be right for you. Still, one important thing not to overlook with FuboTV (especially if you are considering this for a sports fan in your household) is that it does not offer ESPN. Check out our FuboTV review to get the full channel lineup and insight on the service. Platform support and streaming quality are decent, however its price puts it in line with other more popular options, like DirecTV Now, which DOES offer ESPN, making this a less attractive choice, unless of course, you or someone you love is a huge soccer fan. FuboTV does offer a 7-day free trial, which is a decent way to answer the question of ‘can I stream HGTV?’ without any risk. DirecTV launched its contract-free streaming service, DirecTV Now, in February 2017. Now a mature platform, this is great way to slash your cable bill and still watch your favorite HGTV shows. We’ve tested the DirecTV Now platform multiple times and find it an easy and enjoyable way to watch our favorite TV shows. We used to be DirecTV customers but since we cancelled our contract with them two years ago, we’ve saved $90 per month and haven’t had to go without “Flip or Flop,” “Caribbean Life” or “Beachfront Bargain Hunt.” With plans that start at $50 per month, DirecTV Now is one of the best ways to stream HGTV. With DirecTV Now, you don’t need a satellite dish, cable box or any equipment at all other than an Internet connection and a device, which could be a tablet, smart phone, laptop computer or smart TV to access the platform. Plus, you can stream DirecTV Now conveniently through Amazon Fire TV and Amazon Fire Stick as well as Roku, Apple TV, Google Chromecast, IE and Safari. You can even stream on two devices at the same time, which is ideal for those times that I want to watch HGTV shows and my husband wants to watch ESPN or my kids want to watch Disney Junior. It’s like they went through their most popular channels and decided to give them to viewers for the cheapest package option, which is a smart move. If you’re worried about how to get local channels, DirecTV Now includes them in some markets. If you don’t live in one of those markets, you can easily get your local and public access channels by purchasing a Mohu Leaf antenna, like we did. With a low, one time upfront purchase cost and incredibly easy installation instructions, there’s no reason that fear of losing your local channels should keep you from cutting the cord on your cable subscription. Learn more about the benefits of switching to a streaming service in our DirecTV Now review now. With DirecTV Now’s 7-day free trial, you could try watching “Love it or List It” tonight! In our family, we’ve long known PlayStation for its gaming console where we’ve played college and NFL football, but not ever thought about watching it. However, since Sony launched PlayStation Vue as a streaming service a few years ago, it’s now a solid way to watch HGTV without paying for cable. PlayStation Vue’s base package runs $39.99 per month and offers more than 50 channels, including local channels. That’s a ton of content for a relatively low fee. 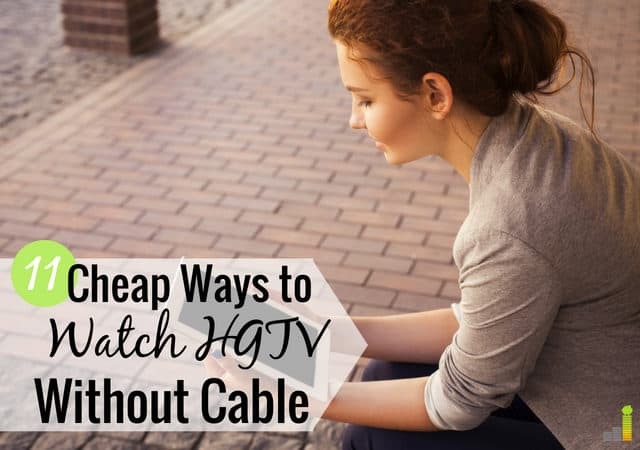 Plus, without a nasty cable contract, it’s an excellent way to watch HGTV shows without cable. The channel lineup includes the usual suspects we’ve already mentioned, like TBS, Discovery, Disney Channel, Disney Junior, ESPN, Food Network, Travel Channel and more. If sports are especially important to you, you can upgrade to their $44.99 per month offering and get ESPN2 and ESPNU. Even better, you don’t need a PlayStation console to stream your favorite HGTV shows through PlayStation Vue. You can watch on your laptop or tablet and it interacts nicely with Amazon Fire Stick and Amazon FireTV as well as many other content platforms including AppleTV and Roku. When we tried PlayStation Vue, we were a bit disappointed with their customer service, but the streaming quality and menus were good and easy to navigate, making this a decent possibility for those looking to cut the cord on expensive cable contracts. As with the other options mentioned, you can watch HGTV without cable or satellite through PlayStation Vue for free, as part of their 7-day trial. If you’re still wondering how to watch HGTV online and in particular, want to know how to watch HGTV shows for free, this section is for you. It is possible to watch certain HGTV as full episodes for free on HGTV’s website, however, the number of shows available to watch for free are limited. This is part of how they make their content appealing to all of the streaming service providers we’ve already discussed. After all, if HGTV gave all of their content away for free on their website, they may be little incentive for people to subscribe to a content streaming service. Still, if you’re traveling or aren’t interested in signing up for any kind of monthly content streaming service, going directly to their website to watch a few select episodes of “Down Home” or “Flip or Flop” might be a good choice for you. There’s one more ‘free’ way to watch HGTV shows online. That’s if you currently have a cable subscription. If you do, you can use your cable’s online app to watch HGTV content. However, without a costly monthly cable subscription and a nasty content, all you’ll see is a black screen. Now, if you aren’t interested in having daily, regular and uninterrupted access to HGTV shows online, another way you can stream HGTV without paying for cable is by purchasing full seasons of HGTV shows on Amazon, iTunes, and other providers. For example, the latest seasons of popular HGTV shows like “Fixer Upper” and “Flip or Flop” are available for purchase on Amazon for about $25 each. If you only watch one or two HGTV shows then that would bring your yearly cost to only $25 or $50, which would be cheaper than paying $20 per month to watch every episode of every show HGTV offers through SlingTV, the cheapest of the online streaming options. If you don’t mind watching older content, you can do what we’ve done in the past, which is catch up on older seasons of popular shows like “Love it or List It” and “Property Brothers” on legacy Hulu and Netflix for free as part of your subscription fee. The bottom line is that you can watch HGTV without cable or satellite but if you want to watch it for absolutely free, you are going to be severely limited in the episodes you can enjoy. Can You Watch HGTV on Apple TV, Chromecast, Fire TV, or Roku? At this point, you may be just about ready to cut the cord on your expensive cable subscription and switch to one of the streaming services we’ve discussed in this article. However, you might be wondering how you can watch HGTV without a cable box. The good news is that it is very easy to watch HGTV online on your laptop computer, tablet or smart TV. If you have Apple TV, Amazon Fire TV or Amazon Fire Stick, Google Chromecast or Roku, they all make it easy to watch HGTV without cable. All of the major streaming device platforms mentioned in this article (DirecTV, Sling TV, Hulu, PlayStation Vue and more) have apps that you can install and use on Roku, Fire TV, Apple TV, Chromecast, iOS and Android mobile devices. The only platform still catching up a bit is Philo, but with the improvements it is making to its service, it’s likely only a matter of time until you can access Philo from your particular platform or device. More good news is that most streaming services support Android TV as well as platforms used by Nvidia Shield, Xbox One and of course, you can watch PlayStation Vue on a PlayStation 4, if you have one. 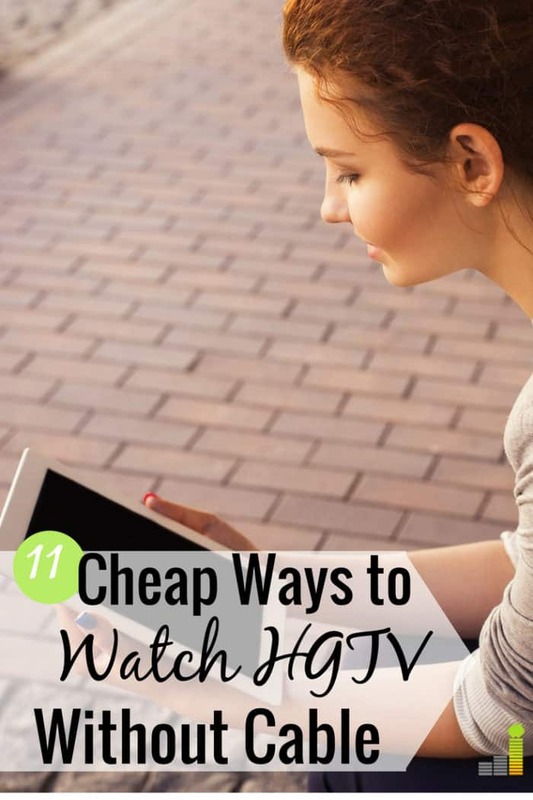 The bottom line is that if you want to get rid of your expensive cable subscription and are ready to watch HGTV without cable, there are so many great ways that you can do it. Today, options won’t be what holds you back. It will just be inaction on your part. If you’re ready to ditch your cable contract and start watching HGTV shows without cable, as well as many of your other favorite shows and channel content, now is a great time to pick a platform and try it for free. If you don’t like it, you can always stick with your overpriced cable contract. What questions do you have about how to watch HGTV without cable? Which of the streaming services have you tried? Which looks most intriguing to you now? What has your experience been trying to watch HGTV for free (or your other favorite shows)? Can we get HGTV on You Tube TV ? Unfortunately, HGTV is not available on YouTube TV Joe. Hulu Live is going to be your best option to get HGTV. I am new to this and don’t understand the difference between services like Hulu Live/Sling TV/DirectTV Now and services like Fire stick, Roku, etc. Why are they different and do I need one of each to cut cable and just use streaming? I’m very confused.